THE STORY - Blindsided by a new generation of blazing-fast cars, the legendary Lighting McQueen finds himself pushed out of the sport that he loves. Hoping to get back in the game, he turns to Cruz Ramirez, an eager young technician who has her own plans for winning. With inspiration from the Fabulous Hudson Hornet and a few unexpected turns, No. 95 prepares to compete on Piston Cup Racing's biggest stage. Lightning McQueen is going through a tough time. After being number one in the racing world for many years, a new and younger generation of racers is coming along, led by Jackson Storm (Armie Hammer), who are leaving him in the dust. After a violent crash puts him on the shelf, McQueen decides to illicit the help of Sterling (Nathan Fillion), a rich business car who runs a new high-tech training facility which will help McQueen become faster than he ever has before. Along the way, McQueen is aided by an assigned personal trainer named Cruz Ramirez (Cristela Alonzo), who not only idolizes McQueen but once had dreams of becoming a racer herself. Together, they will have to learn to work together if McQueen is going to recapture his former glory and prove to everyone he's still got what it takes. “Cars 3” makes the wise decision to not focus on Mater (Larry The Cable Guy) like “Cars 2” did. The focus is put back onto Lightning McQueen this time around. However, with the theme of aging and leaving behind a legacy, plus not wanting to feel stale, the team over at Pixar makes the even wiser decision to focus on McQueen’s unassuming protege in Cruz Ramirez. It’s the kind of interesting twist with storytelling that Pixar is known for and they successfully pull it off here. The beats feel familiar at first. This is a comeback story for Lightning McQueen. It’s “Rocky Balboa.” Does the old timer have one more in him? However, in the third act of the film, it takes a turn for the better and instead becomes less of a film about preserving your own legacy for selfish reasons and more about cementing your legacy and allowing another to carry the torch. So basically, this film goes from being “Rocky Balboa” in the first half to “Creed” in the second half. Ok. The boxing movie analogy is over. What else does the film get right? Honestly, nothing else really matters when the story is as heartfelt and strong as Pixar presents it here. The stakes feel real, the passing of time feels emotional and the hope of new beginnings brings about joy in old and new spirits alike. Sure, the humor does not always land for adults even if the children do not seem to care. All one has to concern themselves with is the following: is “Cars 3” better than its predecessors? Yes. Is “Cars 3” worth bringing your kids to? Yes. After that, what more do you need? “Cars 3” does not feature the best animation in a Pixar movie. It does not have the best music in a Pixar movie4. It does not have the best voice acting in a Pixar movie. However, when it comes to telling a story with heart, passion and a jovial sense of fun, nobody can do it better than Pixar. And that is what “Cars 3” truly gets right here. 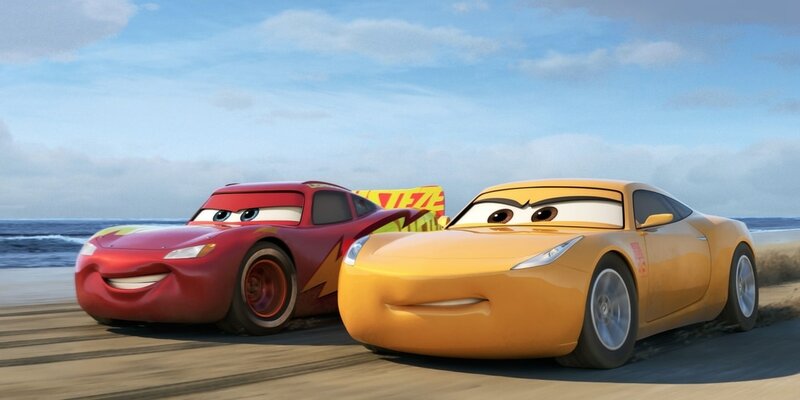 It may not be the best-animated film anyone sees all year but it’s certainly the best “Cars” movies and also proves that Pixar’s streak is still not broken yet. The tales of Lightning McQueen may be over (Possibly?) but if Pixar wanted to keep coming back to the well in an effort to gives us the continuing adventures of Cruz Ramirez, I’d be first in line to get a ticket.